The goal of Little Red Church is to facilitate a low cost, multi-use space for creative individuals and groups to develop their own diverse programs and events. As well, to provide space for private events in a creative environment. 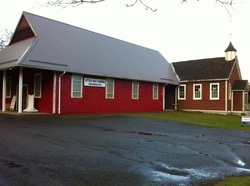 These programs and events are housed at the Little Red Church Hall. ​The concept of this Community Arts Centre is to bring together creative individuals and groups of all sectors and ages , from a large geographical area and provide opportunities and space for vibrant programs and events that are private or public, for the local community and tourists. It is Christmas Eve, 1889. Records don’t indicate whether or not there was snow on the ground but historical documents make it clear that there was excitement in the air! This would be the first year that St. John the Baptist Church parishioners would celebrate Midnight Mass with their very first resident pastor – Father Durand – and with music from a brand new organ played by Mary Downey (nee Anderton). cultural activity for the Comox Valley. For the past two decades... not so much! from Michael Donahue, Joe Rodello and many parishioners. with time – made it impossible to move the building when its future was threatened. foot‐high green ‘Jesus Saves’ piggy bank. food services and liquor licenses. Town Councilors on her side. of the St. John the Baptist Church – and all its land and infrastructures – in June 2012.
flooring, interior painting, new window coverings and more. says Pound with a smile. former bedrooms are now transformed into beautifully decorated and fully furnished private meeting rooms. community groups and more were booking space. In an average week the Healing Centre may be booked for such things as yoga and art classes, Mystic Valley Voices choir practices, Celtic Club meetings, a photography studio, workshop space and more. had to stop, Pound had to clean up the space and move the pews back into place for the Sunday service. with a laugh. “I felt terrible about that! It certainly was a crazy, busy time! the ReStore. New tracking lighting was installed and the walls were repaired and painted a neutral colour. Another month was spent insulating the hall’s attic. project would be amazing!” concludes Pound. Special thanks to Terri Perrin , for writing the article and Christ the King parish archives volunteer, for their generous assistance with fact‐checking and research for this story and the historical timeline that will soon be online and posted on the wall in the Little Red Church Centre. Future renovations on the restoration of the Heritage Chapel is still to come. If you would like to get involved in some way to help with the restorations of the Designated Municipal Heritage Chapel please contact me! Volunteers and Donations would be most welcome, sign up today! Our goal at the Little Red Church Community Arts is about recycle and reuse. We are always looking for items and materials to help with the Community Centre and the people that use it . We are always interested in any volunteer qualified services such as an Electricians , Plumbers ,Drywallers, Carpenters, Architect, Building Engineer and more to give advise or to help out in any way. We would much appreciate your talents and skills in this in this ever going Community project!